Rugby Town begin their latest journey into the relative unknown this weekend, when they kick-off their season in the United Counties League Premier Division with a trip to Peterborough Northern Star on Saturday. The fixture will represent a first appearance in this league for Valley in more than four decades, following their switch over from the Midland Football League at the end of last season after a single year stay there. 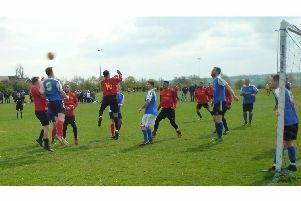 Rugby enjoyed a six-year stint in the UCL in the early 1970s, during which time they faced up to just three of their new division’s current inhabitants - Desborough, Eynesbury and Northampton ON Chenecks, although they have since played four more - Wellingborough Town, Oadby, Deeping Rangers and Daventry - in other competitions. Town rounded off their testing pre-season programme last weekend with another defeat - their third in six warm-up outings - at home to Bedworth. However, as with the previous two losses against Redditch and Hednesford, Valley competed well against opponents two levels higher than them in the non-League pyramid and Town boss Carl Adams should find many positives from what he saw of his new-look squad over the schedule as a whole. Last Saturday’s 2-0 Butlin Road defeat came thanks to two goals in the final ten minutes from the Greenbacks, with Iyseden Christie opening the scoring for them with a diving header, before ex-Town striker Levi Rowley doubled the margin late-on when he smashed a shot past Matt Hill. Adams was without key performers Danico Johnson, Loyiso Recci and Keenah Rosser for the friendly, and their best chances had come in the first half, with Harry Holloway and Lewis Rankin going close early on, before Justin Marsden’s clipped effort was kept out by Bedworth keeper Dan Crane later in the period. Johnson, Recci and Rosser should all be back for Saturday’s UCL game at Peterborough, although Adams will be without his unavailable playing-assistant Marsden. Young striker Sam Lockley continues to struggle for match fitness following his ankle fracture at the end of last season, whilst another Strachan Foundation graduate Aiden Print missed out on all the preparations for the new campaign through injury. Saturday’s hosts Northern Star finished in 16th position in the UCL Premier last time out, and they started the new league season a week earlier than most with a 3-0 defeat at Wellingborough Town last weekend. The club’s roots date back to 1905 when they played as Northam Star, with the current identity debuting in 2005 - three seasons ahead of their elevation up into the division they now occupy. Rugby then travel to Leicester Nirvana next Tuesday (August 7) for their second league fixture of the season, where they will face a side who finished in sixth place in 2017/18. Town’s midweek hosts were formed after a merger with Thurnby Rangers in 2008, and were once managed by ex-Rugby boss Martin Sockett ahead of his return to Butlin Road for a fourth time as Gary Moran’s assistant in September 2016. # Town’s FA Cup Extra Preliminary Round tie at Coventry United next weekend has been put back a day to Sunday, August 12 due to a fixture clash with their Butts Park Arena groundshare partners Coventry RFC, with Rugby’s League Cup clash at Harborough also switched to Tuesday, September 11 because of delays completing the home side’s new 3G artificial pitch. # The club coach to Peterborough will leave Butlin Road at 11.45 am and Tuesday’s trip to Leicester sets off at 5.30 pm.